On Thursday, a system will cotninue to push through the Northeast, while a system pushes through the Southern Plains, and a system pushes intot he West. Showers and storms will be likely from coastal areas of the Northeast, down into the Southeast, associated with a system pushing through the Northeast. On the north side of the system, accumulating snow will be likely in portions of the Great Lakes and Northeast. Lake effect snow will also begin in favored areas of the Great Lakes, with accumulations also being likely. In the Southern Plains and Southern Mississippi Valley, showers and storms will be likely associated with a system pushing through. On the north side of the system, some snow will be likely in portions of the Rockies and Plains. Light accumulations will be likely. 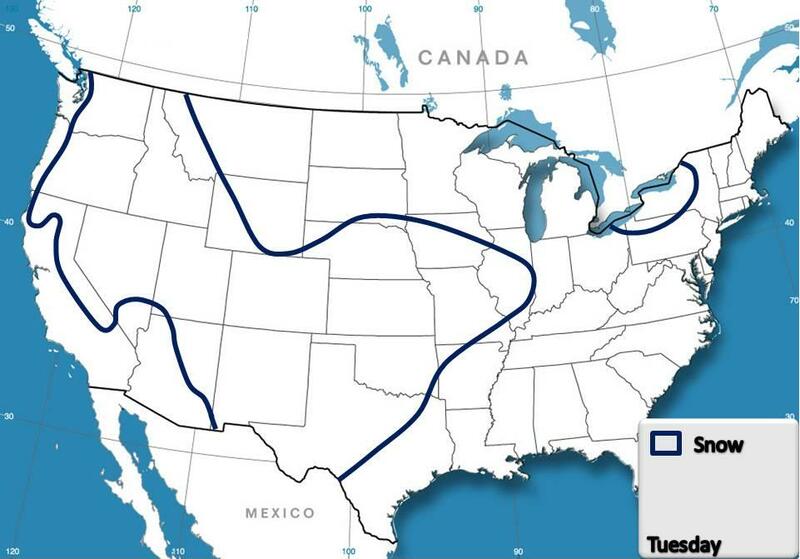 In the Northwest, a new system will push into the region. Rain will be likely along the coast and in lower elevations of the interior. Accumulating snow will be likely in portions of the Cascades, Rockies, and Sierra. 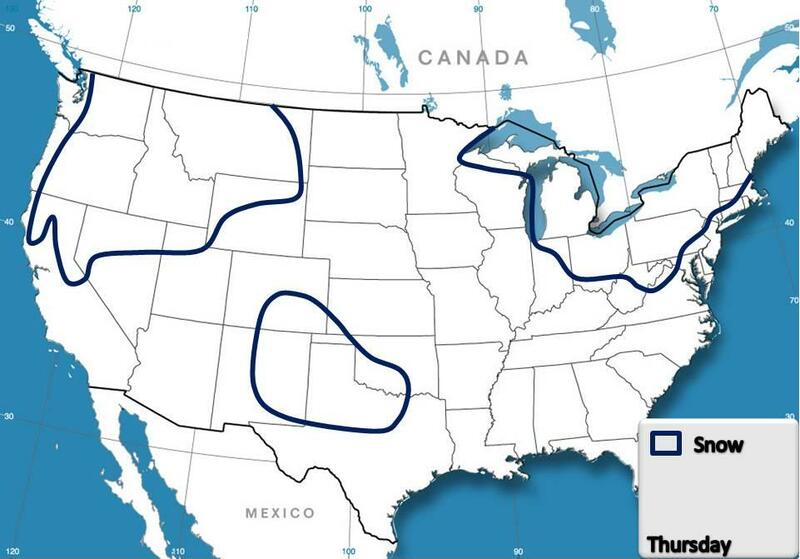 Below are the thunderstorm and snowfall outlooks for Thursday. On Wednesday, a system will push through the East-Central States, whiel a system continues to affect the West. Showers and storms will be likey in portions of the Mississppi Valley and Southeast, associated with a system pushing through the region. Further north, snow will be likely in portions of the Northern Mississippi Valley, Great Lakes, and Ohio Valley. 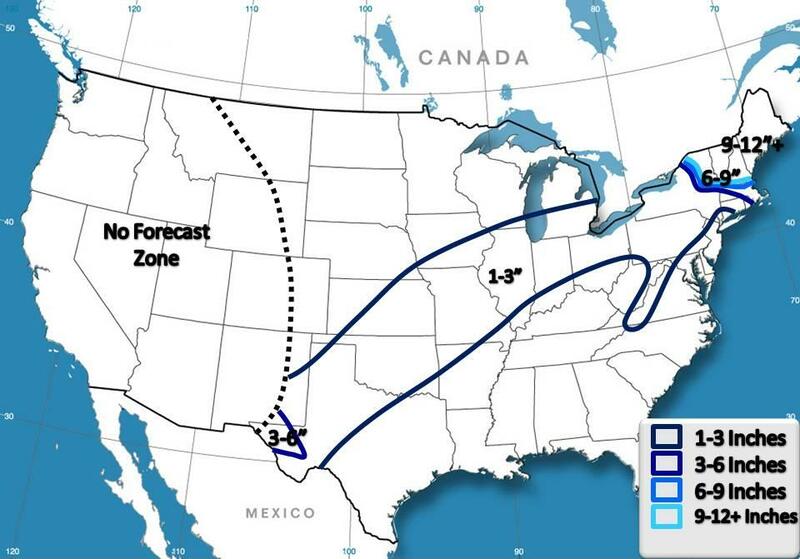 Accumulations of 1-3″ are likely. 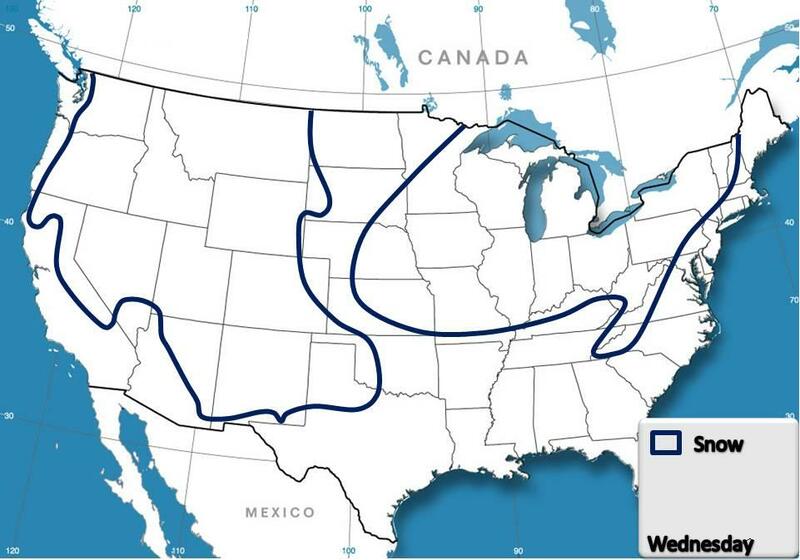 In the West, a system will cotninue to affect the region. Rain will be likely in coastal areas and in lower elevations inland. Accumulating snow will be likely in portions of the Cascades, Sierra, and Rockies. Below are the thunderstorm and snowfall outlooks for Wednesday. A weak system will eject out into the Plains on Tuesday, and eventually strengthen as it pushes up the Northeast Coast by the weekend. A swath of snow will be likely along and north of the track of the system. A general 1-3″ will be likely over must of the areas including the Plains, Midwest, Great Lakes, Ohio Valley, and portions of the Northeast. In portions of the Appalachins and Northern Northeast, accumualtions of over 6″ will be likely, as the system strengthens as it pushes up the coast. Below is the snowfall outlook for this system. On Tuesday, a system will push through the Plains, while a system pushes into the West. Rain will be likel yin portions of the Southwest and Plains, along with accumulating snow in portions of the Rockies and Plains, associated with a system pushing through. Snow accumulations of 5″ or less will be likely in the Plains and Southern Midwest. In the West, a new system will push intot he area. Rain will be likely along the coast and in lower eelvations of the interior. Accumulating snow will be likely in portions of the Cascades and Rockies. Below are the thunderstorm and snowfall outlooks for Tuesday. On Monday, a system will continue to affect the Notheast and Great Lakes, while lake effect snow continues in the Great Lakes, and a system continues to affect the Southwest and Southern Plains. Snow will be likely in portions of the Great Lakes and Northeast, as a slow moving system continues to affect the area. Accumulations are likely, especially in the Appalachians. In the Great Lakes, lake effect snow will be likely, with over 6″ being likely in favored areas. In the Southwest and Southern Plains, a system will cotninue to affect the areas, as it ejects out towards the Plains. Rain will be likely in portions of the Southwest, and accumulating snow will be likely in portions of the Cascades, Sierra,Rockies and Southern Plains. Below are the thunderstorm and snowfall outlooks for Monday. On Sunday, a system will continue to slowly push through the Great Lakes, while a system continues to affect the West Coast. 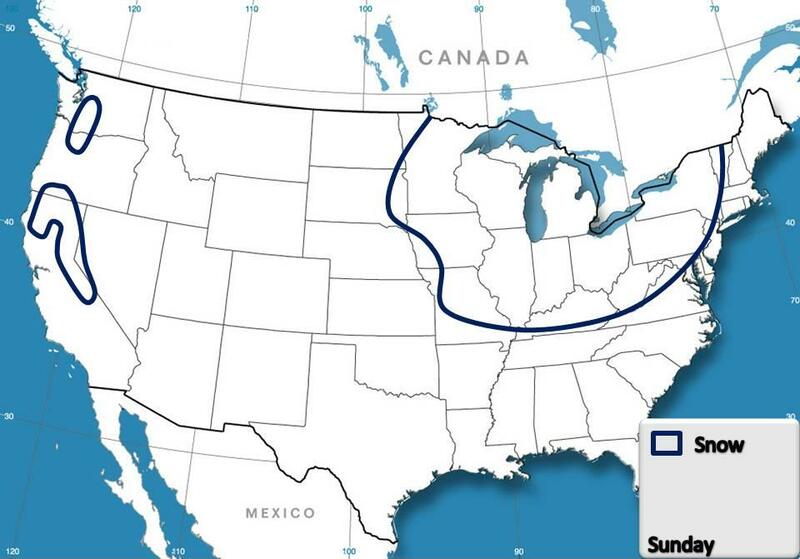 Rain and snow will be likely in portions of the Northeast, associated with the Great Lakes System. Some snowfall accumulation is possible in the Northern Appalachians. On the backside of the system, snow will be likely in portions of the Great Lakes, Midwest, and Ohio Valley. Yet another stronger disturbance will rotate around the main system, producing an enhanced area of snow from Illinois into the Ohio Valley. Accumulations of 5″ or less is possible. In the West, a system will continue to affect coastal areas with rain and accumulating snow in portions of the Cascades and Sierra. Below are the thunderstorm and snowfall outlooks for Sunday. On Saturday, a system will cotninue to slowly push through the Midwest and Great Lakes, while a new system begins to affect the Southwest. 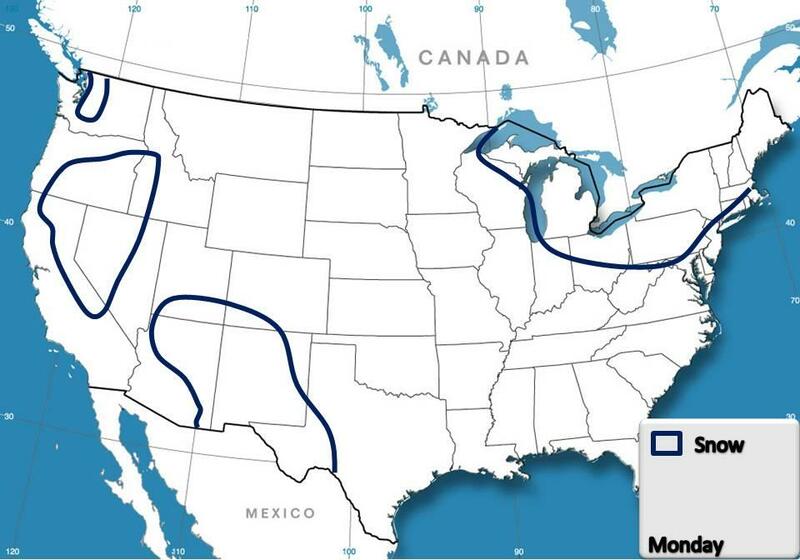 Rain will be likely in portions of the Northeast, associated with the Midwest and Great Lakes system. Freezing rain will be likely in portions of the Appalachians and interior Northeast. Ice accumulations of under 0.25″ are possible. In the Plains, Midwest, and Great Lakes, snow will be likely on the backside of the system. A stronger disturbance rotating around the main system will likely produce a stah of heavy snowfall from Missouri up into Illinois. Accumulation up to and over 6″ are likely. In the Southwest, a new system will begin to affect the region. Showers and storms will be likely, along with accumulating snow in portions of the Cascades and Sierra. 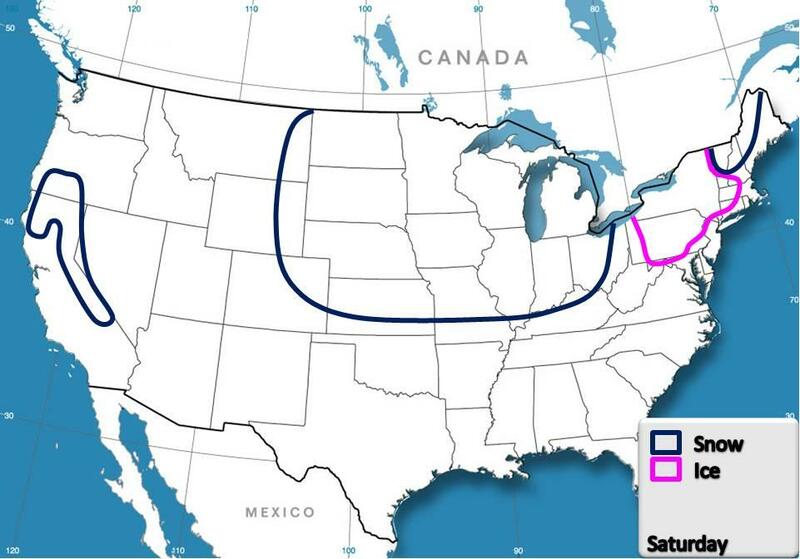 Below are the thunderstorm and snowfall outlooks for Saturday.